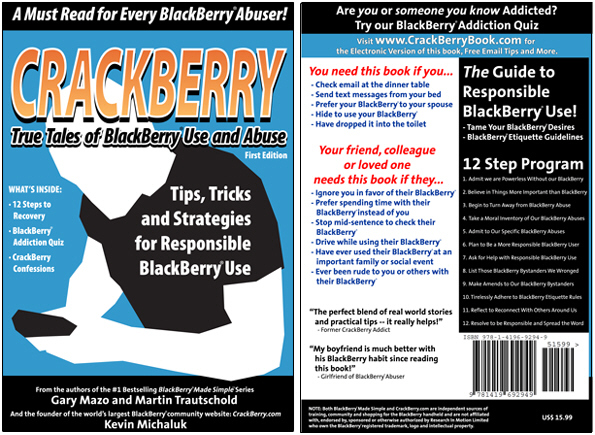 Now Available... the Definitive BlackBerry Addiction Guide!!!! Tips on some BlackBerry features that can help you maintain a "Life Balance"
The book is a must-read for all those who use their BlackBerry smartphones just a little too much. According to Michaluk, "The book is part humor, part Freud and part 12-step recovery plan. We wanted to keep the read entertaining and light while at the same time addressing the ever-growing problem of BlackBerry overuse!" For more information you can view the full Press Release and visit CrackBerryBook.com!